> Movie Posters>Film Posters>Japanese Posters>WARRIORS Japanese '79 Walter Hill, Michael Beck, cool image of gang at Coney Island! 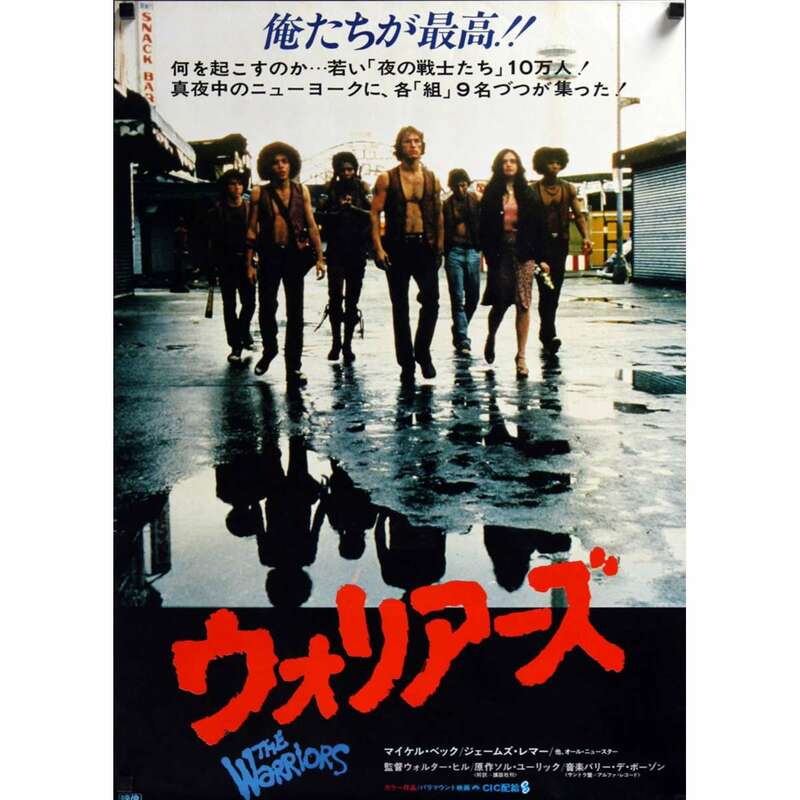 WARRIORS Japanese '79 Walter Hill, Michael Beck, cool image of gang at Coney Island! An Original Vintage Theater-Used Japanese "B2" Movie Poster (measures 20" x 28 1/2" [51 x 72 cm]) Condition: Very Good to Excellent (C7) See our 10 GRADE SYSTEM Page for more information. The Warriors opened on February 9, 1979 in 670 theaters without advance screenings or a decent promotional campaign and grossed USD $3.5 million on its opening weekend. The following weekend the film was linked to sporadic outbreaks of vandalism and three killings - two in Southern California and one in Boston - involving moviegoers on their way to or from showings. This prompted Paramount to remove advertisements from radio and television completely and display ads in the press were reduced to the film's title, rating and participating theaters. In reaction, 200 theaters across the country added security personnel. Due to safety concerns, theater owners were relieved of their contractual obligations if they did not want to show the film, and Paramount offered to pay costs for additional security and damages due to vandalism. After two weeks free of incidents, the studio expanded the display ads to take advantage of reviews from reputable critics including Pauline Kael of The New Yorker. She wrote, "The Warriors is a real moviemaker's movie: it has in visual terms the kind of impact that 'Rock Around the Clock' did behind the titles of Blackboard Jungle. The Warriors is like visual rock". In its sixth week, The Warriors had grossed $16.4 million, well above its estimated $6–7 million budget.